This is the Poochie of corporate training videos. 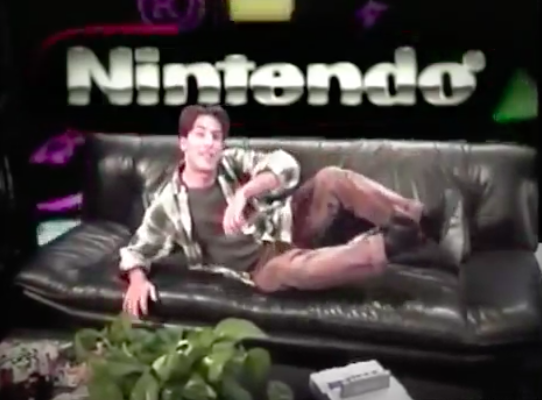 Sent to game retailers before the 1993 holiday season, this demo employs a Bill S. Preston/Jeff Spicoli/Zack Morris hybrid being to take employees through the steps of acting properly as a Nintendo representative. It tries so hard (and fails) to be cool that it doesn’t really accomplish anything else. This guy hangs out on the couch for the majority of the tape, in varying levels of splay. Using a blend of sharp graphics, blaring rock music, grating ‘attitude’ and roleplayed scenarios, employees learn about the differences between the NES, the Super NES, the Game Boy, the advantages Nintendo has over the competition, and how to set up and maintain the various display systems. There are also some heavily stylized interludes of kids playing video games that make no sense. I really can’t overstate how hard this video tries to be cool. Its attempts at being playfully subversive results in it not being clear who this is actually targeted at. I can’t imagine a retail employee getting anything out of this video and a consumer would see right through it. It’s a pretty good example of how corporations viewed kids in the early ’90s, though, so at least it’s worth that. Check it out. A good message in this 1980s anti-drug PSA, but a strange one once the religious blanket gets draped over it. 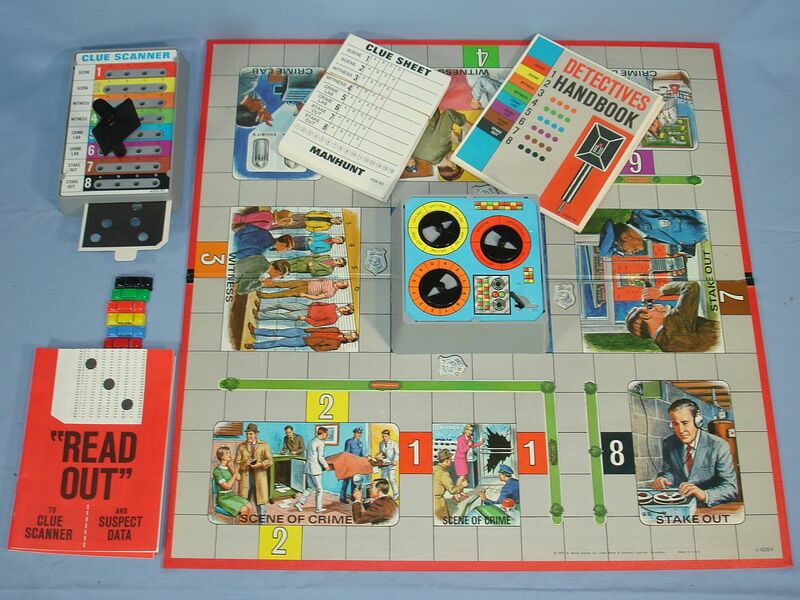 A group of players travel around a board gathering clues to eliminate suspects of a crime. Sounds like Clue, right? No – it’s much more complicated. In Manhunt the players are all detectives. A crime is agreed upon by all players at the beginning of the game and entered into the Clue Scanner. As players move through the game they are given the chance to insert probes into the Clue Scanner which gives more information to the nature of the crime. This information can be used by the players to whittle down their list of suspects and ultimately determine who done it, winning the game. So, Clue. But with a Crime Computer, a Clue Scanner, a Probe, a Detective Handbook, and some other stuff to complicate it up. Still, it’s got a great look and if I had seen this game as a kid I’d have been all over it with all of the devices. Now, a game based on the PS2 game Manhunt? Take my money, please. In 1958, NBC recorded and rebroadcast the first color videotaping, a speech by President Eisenhower. This video starts in black and white and NBC president Robert Sarnoff flips the switch to color a few minutes in. A pretty great capture of a pretty amazing moment, and the movement in the video looks so snappy for 1958. 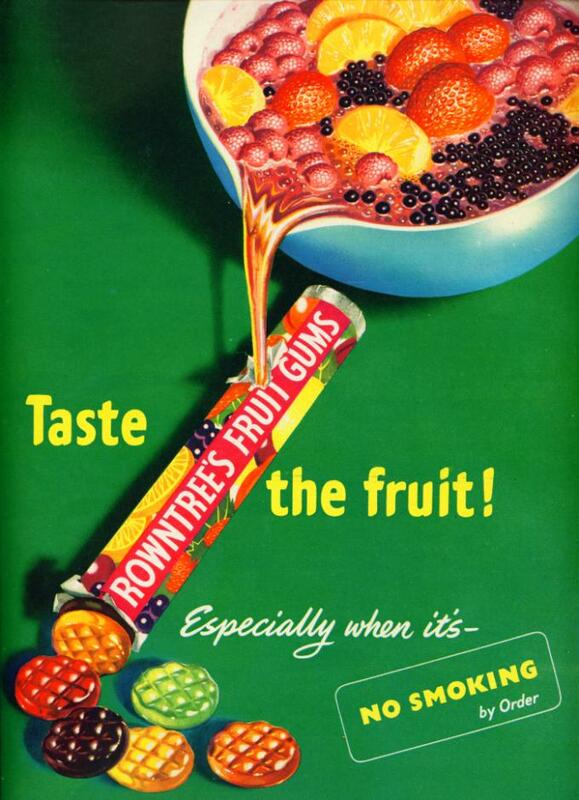 There’s something in 1940s ad for Rowntree’s Fruit Gums that really grabs me.